From out of the thick Oregon mist came a rocket known to fans of Riverside, California’s Notre Dame High School football. Kenjon Barner blazed into the University Park neighborhood of Los Angeles at full speed and never slowed. He waved to family and friends while torching the turf for enough yards to shake even the sleepiest fans awake. His rushing performance earned national and PAC12 player of the week notice. That’s a great week for the hometown crowd. He ran for enough yardage to make every team in the nation, from Pop Warner to the NFL, notice. To any football fans who pick a new favorite player each week: Kenjon Barner is the guy. Barner didn’t make the trip south two years ago due to injuries from the Washington State game. Playing behind LaMichael James didn’t leave a lot of room to shine on his best day, either. That happens when you’re in the same backfield as the greatest running back in Oregon history. It’s hard to shine so bright when he plays only half the game. Oregon coach Chip Kelly gets his team ahead early and rests his starters. It’s called sportsmanship, something other top schools seem to forget while they pile up career stats. The Ducks understand the nature of the season. They save their high impact players for high stakes games. No big games, no big names. Think of who showed up big for the biggest game of the year to date and Barner showed up even bigger. The new guy made his name against USC. Barner out-tailbacked Tailback U in their house. The Los Angeles Memorial Coliseum hosted two Olympics, along with Super Bowls and the World Series. None of it matters after the Oregon Ducks flew into town. A big game like USC vs Oregon brings big names. 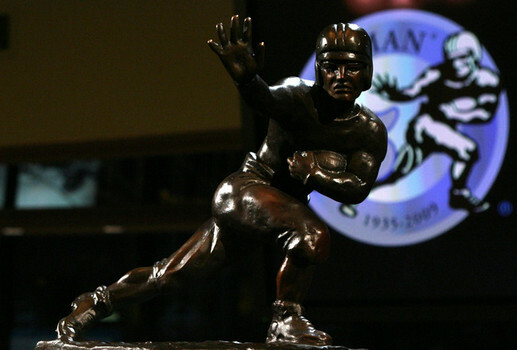 In college football the biggest names belong to Heisman Trophy winners. Since Oregon’s trophies are in the future, the Heisman Box in the LA Coliseum was crowded with Trojans. There was Mike Garrett’s Heisman ’65 chair. Since the team is coming off severe NCAA penalties imposed during his tenure as USC Athletic Director, the chair looks like it’s taken an equally severe beating. Next to Garrett’s rented seat was O.J. Simpson’s electric chair. The Simpson Heisman ’68 perch sat empty but for a trading card from his 2000 yard NFL season. If O.J. watched Oregon run on USC, he saw it from Nevada’s Lovelock Correctional Center where ol’ Number 32 carries a thirty-three year sentence for armed robbery and kidnapping. He is proof that what happens in Vegas doesn’t always stay in Vegas. A small white couch served as the Charles White Heisman ’79 lounge area. It was donated by a Cleveland-area drug dealer. While not a player of Juice’s stature, White did show it’s possible to overcome a cocaine habit and become a productive player in the NFL. He even returned to coach at USC. The Marcus Allen Heisman ’81 bench sat in a corner. It has burled figures on the surface because it’s made of driftwood. O.J. and his wife picked it out before their separation. Driftwood construction was the consensus choice all around. Carson Palmer’s Heisman ’02 tiger striped chair was in the middle of a new paint job. The Bengal motif was changing to Raiders’ silver and black, baby. Instead of a chair in the LA Memorial Coliseum Heisman box, Matt Leinart has a Heisman ’04 hot tub. Next to it is a miniature hot tub in case he brings his son to a game. USC co-eds reserve the seats in Matt’s pool. No one can guarantee the Heisman Box at Autzen will be populated by better character guys than USC, but it’ll be hard to find worse than a negligent AD, a murderer (allegedly), a dope fiend, a hot tub addict, and someone who takes an entire season out. Plus Carson Palmer. With Kenjon Barner on the Heisman watch, how can you tell if he’s as good as he looked against USC? Because LaMichael James said he was. That’s good enough. We don’t need Ahmad Rashad fawning over him to convince us. We can call USC and ask them. Cruel and unforgiving to say the least. But that’s what happens when priorities hit the fan.